From Madras, Oregon to Columbia, South Carolina, Americans are stepping outside to take part in the first solar eclipse to hit our land in decades. I have several friends who've taken road trips to prime viewing areas, and I have to admit, I'm a little jealous. 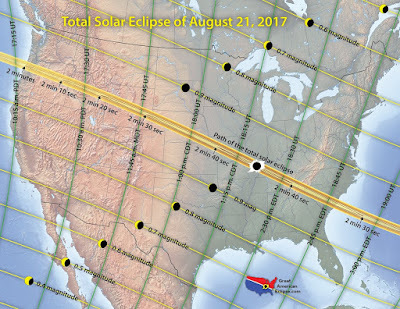 If you're viewing today - even in an area that won't experience totality - please remember to do it safely. Check out NASA's safe viewing guidelines and don't risk your eyesight. You may need it someday for the next eclipse. If you're out driving in an area experiencing the totality (or even close to it), stay safe. The totality only lasts minutes but it takes a couple of hours for full sunlight to return. Most of all - have fun! Join your neighbors and countrymen in the one thing that's managed to unite us this year!